I wasn’t sure if I was going to dig the venue at first, but the Bathurst Street Theatre has been transformed into the perfect stage for Fallen Rock Productions production of Rent. The cast is young. Many of the fresh faces are recent University graduates and, for most of the cast members, this is their debut performance with Fallen Rock Productions. After the development of a cult following, Tony Awards, performances around the world and a mediocre film adaptation, I probably don’t have to explain the plot of the musical Rent to anybody reading this. But in case I do, it’s the story of a group of young bohemians living in New York City and struggling with love, the AIDS epidemic, and rent payments. I am really excited by the fact that the proceeds from this production of Rent are going to the Pediatric Oncology Group of Ontario, or POGO. Fallen Rock Productions has donated over $350 000 to various charitable organizations over the course of their last eight seasons; pretty amazing stuff. I have to say, I was completely and utterly blown away by many of the performers in the company. On the subway ride home, I was struggling to find words strong enough to express how immensely talented the young people who make up the cast of this particular production are. Let me take a step back. Designer Anna Treusch turned Bathurst Street Theatre into a playground of metal, lights, and steps that suit the action of director Jason Spetter’s interpretation of the musical perfectly. The fabulous design allows the actors to create a high-energy and all-encompassing world for the audience to get lost in. I’d never seen Rent on stage before this production. My show partner, Rodney, cringed when he heard this before the show; having seen professional productions of Jonathan Larson’s musical four times already, he was concerned that I might be disappointed by such a young and fresh cast. I can honestly say that I was not disappointed. Stand out performances for both Rodney and I are David Coomber in the role of Mark and Kelly Holiff in the role of Joanne. The performances by both actors are mesmerizing and I found it difficult to tear my eyes away from them when they were in group scenes. Holiff gave the most mature performance of the night and has the strongest, most mellifluous female voice I’ve heard on stage in a long time. Coomber, whose work I have seen in recent years and who never disappoints, has applied his own youthful and exciting interpretation to Mark’s character while still maintaining his quirky spark that Rentheads everywhere have grown to love. I would be remiss if I didn’t also mention how wonderful Tess Barao and Colin Asuncion are in the roles of Maureen and Angel respectively. Barao is a tiny powerhouse with a huge voice while Asuncion, simply put by another audience member, is Angel. However, it’s worth noting that these standout actors are supported by an incredibly solid and thoroughly talented ensemble who give energetic and captivating performances the whole way through the two hour show. My main qualm with the show (which, admittedly, opened the night that I was in attendance and was still working out some kinks) was the sound levels. It was very difficult to hear some vocal performances over the sound of the pit band; who are fabulous, by the way. Rodney had some issues with the choreography. He found a lot of it out of place and couldn’t really find the reasoning behind some of the dance choices in particular songs. Overall, however, it was a thoroughly enjoyable production. You all know how I love new Toronto-based performers. This show is full of them. 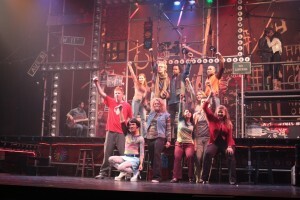 Refresh your memory on the words to “La Vie Boheme” and go see Rent before it closes. You’ll want to sing along.